But how do you harness the good market for mobile home park investing? The first step – in our minds – has always been to lay out a reasonable, detail business plan. This plan should include goals for 2019, as well as for at least five years beyond. We still have our goals and plans from our early 20’s and it’s a constant reminder of what we have tried to do in life and a scorecard on how well we’re doing. If you have not made your New Year’s Resolutions yet, then we encourage you to get out a pad of paper and begin today. Make a list of your material and lifestyle goals and then work backwards on how to attain them. And don’t let writer’s block stop you. Remember that General George Patton once said “a good plan today is better than a perfect plan tomorrow”. 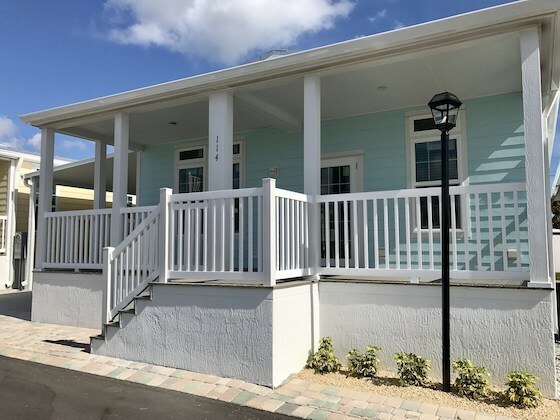 Finding a mobile home park to buy, and getting it purchased, is really just the cumulative effect of a number of small, easy-to-achieve steps. But that all begins with writing down some goals for 2019 and saying to yourself “I am going to get these done no matter what”. We would also like to take this opportunity to wish everyone a Happy New Year! There’s nothing more worthless than a goal that is not supported with action steps. That would be like the U.S. in the 1960s saying “we want to land on the moon” but having no roadmap to do that. To attain goals the steps to do so are equally as important as the mission. So what are the ten main steps to buying a mobile home park? What are you after in investing in affordable housing? Are you trying to beat the rate of return on that CD in your investment account, or are you trying to boot strap into the business and create capital to invest? On top of that, what’s your appetite for work and for risk? You see, not all mobile home park deals are the same, and you have to acknowledge what the goal is before you even set out on the path. More most people, the goal is to achieve a 20%+ cash-on-cash return on their existing capital using a reasonable amount of effort and risk. But there are those out there who would prefer 10%+ with very little time and risk and another group that wants to make $100,000 in cash-flow off one deal or even amass $100,000 in capital with virtually zero down. All of these are possible, but the type of deal required is entirely different. Warren Buffett once said “risk comes from not knowing what you’re doing”. This is good advice for mobile home park investing, as well. There are many “deal killers” that the average real estate investor is unaware of when it comes to “trailer parks”. These include permit issues, lot size issues, orangeburg sewer lines, packaging plants, lagoons – and many more. In addition, there are five drivers to park profitability which are 1) collections 2) occupancy 3) water/sewer costs 4) property condition and 5) B/A/D. If you’re going to invest significant after-tax income in a mobile home park deal, you owe it to yourself to become highly knowledgeable on the topic. There are many different mobile home park business models. If your goal is to buy a stable park and make 20% cash-on-cash returns, then the goal is to buy an investment-grade property with either a 3-point spread at closing, or within a short period of time via raising rents, sub-metering water & sewer, or cutting cost. If the goal is instead to make a large amount of cash flow per year, then you will need to buy properties that are in rougher condition and that you can make much larger advances on in terms of net income via significantly filling lots, cutting costs, raising rents and bringing the park “back to life”. You should also consider the metrics of the size of park you will need to hit your goals. The general rule in park buying is 20% down, so you can work backwards on the size of deal that fits your budget. And also don’t forget that the fastest way to make $100,000 cash flow on one park is to buy a property that has 80 occupied lots and that you can increase the lot rent over time by $100 per month – the bottom line is that scale is an important feature as well. Although we have learned that a good park 2,000 miles away from your house is infinitely better than an average one in your back yard. That being said, it’s difficult for someone new to the industry to feel they have safety and control of their investment if the park is beyond about a five-hour drive from their home, That radius allows you to drive out to the park and back on a Saturday. So if you draw a ring 5-hours distant from your home, that’s the normal territory for most buyers. In some parts of America that area will contain several states and a plethora of large metro markets. There are five basic ways to find a mobile home park to buy: 1) on-line 2) brokers 3) cold calls 4) direct mail and 5) driving up and talking to the owner. The important thing is to do all of these simultaneously fo the best results. Right now, roughly 50% of our deals come from brokers, but there have been periods when it was one of the other search engines that brought us the most success. By “building your funnel” we mean that you systematize the process of finding deals to looks at, and then work that system rigorously. One of the most important strategies in finding the right mobile home park is to focus on volume. Those who look at 100 deals always seem to do better than those that only look at 10 – which makes complete sense. Unlike buying your personal home (in which you might look at 5 or 10 potential prospects) the mobile home park industry is all about looking at hundreds of deals if possible. There are around 1,000 on-line on Mobilehomeparkstore.com alone. Don’t be satisfied with only turning over one stone – turn them all over. One terrible habit of many potential buyers is to approach each deal as a “deal killer”. When this occurs, you’re basically working against yourself, because the potential in any deal is what’s important to isolate, not just a “that won’t work” without even understanding that potential. Many of our best transactions have started out as things that most buyers would cast aside because they did not fully understand the quality of the property or the market. A 3% cap rate in Austin may look undesirable until you find out the lot rents are $200 per month and the market is $600. The deal with 40% occupancy may scream to you “no way” until you find out that the demand in the market is so high you can rent the vacant lots to a dealer day one. Many deals can be cured simply by price reduction or creative seller financing. So see your job more as an inquisitive scientist and not a dour attorney. We are constantly making offers because there’s no harm in that at all. We will offer someone 50% less than asking price if that’s required to make the deal work. And we’ve had sellers accept that offer because they’ve had no success at their inflated price. The bottom line is that you never know until you try, and you should never be shy about making educated offers regardless of what the seller is asking. The worst that can happen is you open the door to continual conversation. When you find the deal that interests you and tie it up under contract, you owe it to yourself to do fantastic due diligence. Benjamin Franklin once said that “diligence is the mother of good luck” and he was entirely right (although 200 years ahead of his time for buying mobile home parks). There have been logical steps created and perfected to ensure every line of your revenue and expense budget are on-track, as well as to gauge demand, permit status and every other function of your transaction. Warren Buffett said that “risk comes from not knowing what you’re doing” and there’s no reason that you cannot nail due diligence if you follow the established process. Mobile home parks – like all real estate – are dependent on financing. Nobody buys mobile home parks for cash and they’d be foolish if they did. It’s the use of leverage that allows for 20%+ returns. If you pay all cash, your cash-on-cash return would only be the cap rate. So basically good mobile home park buying requires smart approaches to financing. There are basically five types of financing for mobile home parks: 1) seller carry 2) small-town bank 3) national bank 4) CMBS “conduit” ands 5) Fannie Mae and Freddie Mac “Agency”. The good news is that mobile home parks have the lowest or next to lowest default rate of any type of real estate loan. This makes us extremely attractive to banks, and you rarely hear of a good deal that is unable to obtain financing. But you need to know how to fill out a loan request, to meet with a bank, to use a loan “broker”, and to properly pitch seller financing. Those that have conquered financing are unstoppable. Buying a mobile home park is the ultimate contrarian hedge to a declining America. This list will get you started. Can You Spot The Twelve Similarities And Differences? 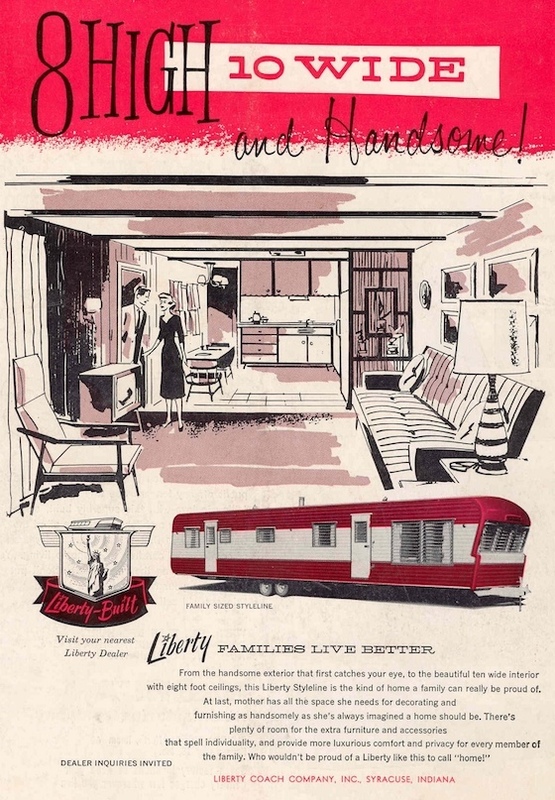 This is a 1950’s advertisement from a manufacturer called Liberty Coach Company in Syracuse, Indiana. Compare and contrast the home reflected in this ad to the modern equivalent and find the top twelve similarities and differences. The demand for affordable housing (in fact, it’s higher today than ever before in U.S. history). The rough dimensions of a mobile home (while they still make 50’ lengths, the width has changed from 10’ to 14’ or slightly larger). The exterior of the home is not as appealing as the interior. The living room/dining room/kitchen in one single area with no separating walls. The desire to live in smaller spaces (just look at the Tiny Home programs on HGTV). The affection for Mid-Century Modern design. 8’ ceiling height. Most homes today have vaulted ceilings that offer more headroom. “Flat roofs” which were banished by the late 1970s as being inferior for drainage and now can only be found on RVs. They were replaced with “round” and then “pitched” roofs. Louvered windows (they were a bad idea back then, too – they break easily and leak). Formal attire inside a mobile home (haven’t seen it since the “Long, Long Trailer” with Lucille Ball in 1954). The demographics of the mobile home customer, which was higher than that of single-family home residents in the 1950s (although it may still be the case in some CA and FL retirement parks vs. single-family neighborhoods in the same markets). The word “coach”. We’re not sure where it came from in the first place. It makes a mobile home sound like a horse-drawn carriage. Will there be more changes over the next 50 years? We hope so. The product is still not perfect, particularly concerning the exterior design. But it will be exciting to see the changes! In 2018 we became huge customers of Purchasing Platform – one of their largest. And we suggest any park owner to look at what this new buying service can do in regards to positively impact your community. It’s literally a game-changer. Purchasing Platform is an online GPO (group purchasing organization) and eMarketplace that has been created specifically for the mobile home and mobile home park industries. More than 1,800 MH communities access Purchasing Platform every month to take advantage of their pre-negotiated pricing, single checkout from 40+ vendors, auto expense mapping to their chart of accounts, multi-level workflow approval to provide accountability across their portfolios, etc. They offer 20-30% savings on more than 10 million products and an integrated "Buying Desk" service that acts as a purchasing agent for your community to make sure they always deliver aggregate savings on every order. How big do you have to be to use Purchasing Platform? Can you use it with only one property? The answer is yes – there’s no minimum limit of properties or dollars spent. Some of the largest industry portfolios use them but the majority of their clients own and operate between 1 and 30 mobile home parks. This is not a service that is only available to the largest owners – it’s one that every park owner in the U.S. can utilize. In addition to the obvious cost savings on products and services, use of Purchasing Platform drastically reduces the number of trips your manager has to make to retail stores (time spent not managing your property), eliminates the need for expense classification and receipt transcription while also providing valuable oversight to the owner with workflow approval. They also allow members to load their own catalogs to make sure that managers only can order what they want them to. Easy to use interface. Not hard at all for any manager to master. Single checkout from more than 40 of the industry’s largest vendors. Huge savings on more than 10 million products. Price Match Guarantee: if you can find it lower somewhere else, they’ll match it. Create your own custom catalog. On-Demand Buying Desk feature gets you immediate support for volume quotes. Comprehensive Workflow Approval functionality to keep you in control of all buying. Maps out all expenses to your Chart of Accounts. Integrates everything seamlessly into your property management software. Purchasing Platform allows all park owners to try their system for three months with no obligation to continue. That’s how we got started – we gave it a try and liked it. So if these advantage look good to you (which they certainly should) we recommend you contact Purchasing Platform today at 312-622-6552 and [email protected] and get set up on a 90 day trial. We think you’ll find this to be one of the big improvements in your operation for 2019. A recent article in Time magazine entitled “Affordable Housing is Disappearing: These Mobile Home Park Residents are Fighting Back” offers their perspective on the thorny issue of bringing lot rents up to market levels. And, with most mobile home park rents ridiculously low from coast to coast, it’s an important topic for all mobile home park owners to think about in the New Year. A group bought a nice mobile home park in Akron, New York. The lot rents were about $300 per month while the market rents were about $500 per month. So the buyer raised the rents to $425 per month – still well below market but much higher than mom & pop had charged. The residents were still receiving the best value in town, and the property is a bargain at those rents. The residents were outraged that the new owner would dare raise their rents and stop doing such activities as winterizing their water lines for free. Despite due notice of the increase and explanation for its necessity and the great value it still offered, they objected completely to the mere concept that they would lose their insanely low rent and freebies. There is no rent control in the area in which the park is located. The owner is free to raise the rents to whatever level they feel necessary. The only law is that you can only increase the rents one time per year. That’s it. So nothing the new owner did was illegal. They simply endeavored to bring the rents in-line with their peers. So why does the media care? Many media outlets like to feature any story that portrays American business as heartless and “ripping off” the consumer. That’s the tone of this article, as it gives 90% of the story line to the residents who hate paying more rent and about 10% to the reasons why rents need to go up (including the quote by Frank that said “We’re the only folks out there who provide unsubsidized affordable housing,” he says, “but we get criticized for trying to run the business as a business.”). The most important parts of the actual story were left out by Time. First of all, without higher rents the park will ultimately be torn down and replaced with apartments – which rent for $1,000 per month more than the lot rent. This happens across America on a regular basis. In addition, there would be no major capital expenditures going forward if rents do not allow for that. Secondly, the narrative on non-profits helping the residents buy the property is a joke. The New York based non-profit they describe has done only 21 deals in 30 years, and ROC, the other group that does these type of structures, has only averaged 12 per year. The “Democratic assemblyman” that talks of creating a bill that restricts rents to the CPI increases has no actual support and any such concept would likely be shot down in the court system – not to mention the fact that any landlord who saw such a misguided bill coming would simply raise the rent up to market instantly and well before the enactment date. Having been the unlucky recipient of similar media attention when we raised the lot rent in our park in Austin from $360 to $450 per month (despite the fact that market rents are $600 per month there), this is a narrative that will be seen over and over again in the years ahead. The real story is simple. Mom & pop never kept their rents in-line with inflation for decades at a time. This “quantitative easing” of mobile home park lot rents has been taken for granted by residents who now are faced with paying what they should have been all along and they don’t like it. Charles Becker, an economist at Duke University wrote a paper on this phenomenon a couple years ago, asserting that mobile home park lot rents in the U.S. are likely 40% too low. As the industry consolidates, mom & pops sell to professional owners and rents go up based on economics and not “quantitative easing”, mobile home parks will stop being re-developed and residents will enjoy more capital improvements and professional management. Effectively, higher rents are good for tenants, not bad. But don’t expect to see that in any news story! Is there any sector of American business that faces as much discrimination as mobile home park owners? We’re not allowed to set our rents based on market forces, nor are we allowed to make a profit – at least as far as the media is concerned. Yet we are the only form of non-subsidized affordable housing in the U.S. And we get zero credit for that. Pretty sad. Want To Re-Finance Your Park Using The New Agency Debt Product? MJ Vukovich is an expert on Agency debt and he works for Bellwether Enterprises, which is one of the top underwriters on this specialty loan product in the U.S. He is also a third-generation park owner who speaks your language. So give him a call today at (612) 335-7740 and let him tell you what an Agency debt loan can do for your property, or email him at [email protected]. Before you even begin – what’s your trash system? Nothing destroys paved roads more than dumpster trucks. They weigh the equivalent of a locomotive – about 25 times more than a car. In many cases, there’s little point to investing massive amounts in your roads until you’ve found a way to get those giant trash dumpster trucks off your roads. If you have to use dumpsters, put them near the entrance to your property with a nice enclosure. If not, see if you can convert to polycart as those truck only weigh about half as much and your roads will hold up better. Get that accomplished before you do your paving work. The cost to patch asphalt professionally is around $4 per square foot. That’s for the type of fix job in which the pothole is cut out and then the asphalt is professionally paved back in that square. However, another option is to use “cold patch” which is an air-drying asphalt derivative that you can buy in sacks at most Home Depot stores. You open the bag, pour the contents into the pothole, and tamp it down with a 4” x 4” post (also available at Home Depot). This stuff costs around $20 per bag and you can just load some into your trunk or SUV. But it is nothing like real asphalt, and if your patch holds for a full year in a busy travel lane, it’s a miracle. These are most effective for patching small, cosmetic potholes in the middle of the street. Also sometimes called “emulsion” this is when you basically spray a black oil solution over your existing road to make it one solid color and jet black. This is very hard to price by the foot because it’s basically a spray gun that “paints” your road black. In many cases, it can make an old, worn-out, gray road look new again. But, like cold patch, it’s not super long lasting, and will begin to fade off pretty rapidly. Sometimes the correct fix to deteriorating asphalt streets is to place a “skim coat” of asphalt directly on top of the existing road. This is mostly a cosmetic solution, as the real cause of those potholes was failure of the road base, and that’s not cured in this procedure. The cost to do a 1 ½” asphalt skim coat is around $2 per square foot. This is the manner in which most county roads are paved. It’s a mixture of rock and tar and has a unique power in that it actually gets harder over time. It also gets a smooth surface after a whole bunch of use. Best of all it’s pretty reasonably priced, at around $1 per square foot (based on a two-ply application). But the bad news is that it’s extremely messy to install – your residents will track tar all over the place when it’s first installed. So make extra careful that you can actually get this type of road successfully installed without causing an unbelievable mess. We’ve had cities ban us from installing this type of road due to the potential mess it can cause. Let’s assume your road is completely shot – or that there’s no paved road to begin with (only dirt). Then you need a full paving job, including road base (the stuff that holds the asphalt up). A new road costs around $3 per square foot. This is the most expensive option, but the best product and the longest-lasting. One of the important final pieces to a great looking paved road is the striping. Whether it’s yellow or white – or red for fire lane – it’s the crowning touch that makes your road look truly professional. There are many options here as you can buy a striping rig (or rent one) for not much money, and just do it yourself using spray paint. Or you can hire the paving company to do it (and they will do a better job as they have more expensive equipment). Figure on a cost of about 35 cents per linear foot to have the pros do it. It’s definitely money well spent. Paving is a significant cost and should be invested only with the utmost of strategy. This list will get you started. And don’t forget to get at least three bids to get the best deal. They are the brightest. They are basically the only solar provider we’ve seen that cast enough light to truly be a replacement for traditional hard-wired or gas sources. They rarely break down. We’ve had no problems with our units at all. Affordability. Outdoor solar lights are extremely cost-efficient since they are operated by rechargeable Li-ion batteries via the sun and do not require any digging, trenching or wiring whatsoever. In addition, Gama Sonic’s products are manufactured using LED’s. Using LED solar lights are ideal for owners looking to cut back spending since these LEDs will last for 10-years and use zero electricity. But even if the power cost was the same as conventional electric or gas, you’re talking several thousand dollars saved in installation alone! Safety. If your homes and communities appear to be occupied by having lighting fixtures in place, it can decrease the chances of having the property getting broken into or vandalized. And for areas known for having bad weather and power outages, exterior solar lights are beneficial since the solar fixtures would continue to function as they normally would since they are operated by rechargeable batteries – you have no reliance on the local power or gas company. Hassle Free. Just look at your existing electric or gas coach lights. They are a management nightmare with bulbs or elements going out, tops broken or missing, leaning rusted poles – you name it. They’re incredibly expensive to fix or replace because you have to hire an electrician or gas plumber to re-connect them to the utility line – and that’s assuming you can even find the parts available for that old 1973 model. Limitations come when owners decide to use standard gas or electric outdoor lighting. With solar lighting, installation takes minutes and does not require costly routine maintenance or any digging, trenching or wiring. And you don’t have to change bulbs for a decade! If you’d like to learn more about their solar lighting and special pricing, click here or call Matt directly at 727-688-5030. I will be at the Louisville Show again this year, so you’ll find me either at the Gama Sonic, 21st Mortgage or Clayton booths, lining up our own orders for the New Year. See you there! It’s a pretty common sight to see a non-running vehicle in a mobile home park. They are often easy to spot as they have at least one flat tire, such as the one in this photo. But they are a really bad addition to your park and are a very visible sign of poor management. So how do you correctly tackle the non-running vehicle problem? Let’s start off with the definition of a “non-running” car. Technically, that group would include cars that simply have their inspection sticker out of date. But that’s not the right way to approach the topic. To us, a non-running car is one that is clearly non-operational and serves no purpose as far as transportation. They typically sit in your park on one or more flats, and with weeds growing through the bumpers. They are effectively yard art – and unattractive decoration at that. Why are they so pervasive in mobile home parks? Mobile home parks have an above-average level of these vehicles. Why is that? There are basically two reasons 1) many of our residents have very small budgets for automobiles, so they tend to buy cars in extremely poor condition, sometimes for a few hundred dollars cash and 2) they have no money to fix them when they break down. Cars that are one-step ahead of the junk yard often end up in mobile home parks. So what do you do with these vehicles? The best answer is simply to hire a tow company to come into your park, sticker the offending cars, and then pull them out. There really is no Plan B that works. You asking the residents nicely to do that will have no impact as they cannot afford to hire a wrecker to get them to the dump. Although a towing company is an important resource in getting the job done, don’t ever enter into a contract with them in which they get to cruise through your property as often as they want and remove “non-running” vehicles – they won’t go for the junkers but the nicer cars that simply have their plates out of date. This will then cause your resident to miss work, lose their job, and not pay you rent. And you accomplished what in this case? You’ve wrecked your budgeted profitability. Don’t let a tow company hi-jack your business! Are you aware that you can be sued in conjunction with the towing company going wild? 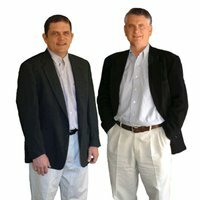 I’ve been sued twice by residents who had cars towed under the “free roam” contract of a tow company. You can be sued for the car not actually being “non-running” as well as for there being damage to the car as a result of the tow. These type of suits only occur with nice newer cars that you would never request a tow company to remove in the first place. Another reason to not let the tow company hi-jack your business. Non-running cars can be a big deal in some mobile home parks (but not all). Tow companies are the natural solution. But properly manage them, select which cars are truly “non-running” to be tagged, and never enter into perpetual “free-roam” contracts with them. These meters are read remotely and do not require our managers to read them (or screw up the readings). The meters are read by Metron every 60 minutes, 24 hours a day. As a result, Metron can alert you when there’s a leak, and that can save you thousands of dollars per year. The meters are amazingly accurate and strong. Metron’s meter bodies have been manufactured in Europe for years – they are well-established and a proven performer. Metron’s electronics are built and tested in Boulder, CO. The cost is only around $5 per month per meter, and in most states this cost can be passed on to the resident. These meters do not require you to have access to them, so they are perfect for winterization or difficult access situations. So why would you not use Metron? We don’t have a clue. To get more information on Metron metering, call Rick Minogue at 303-449-8833 or email him at [email protected] Tell them that Frank & Dave sent you. We’re their biggest fans. Are You Using Your Spare Time To Maximum Advantage? Many – if not most – park owners have full-time day jobs. They juggle park ownership with holding down often demanding professional occupations. They do so using highly efficient time management. Taking control of your time can yield big dividends. I found a copy of a 1926 magazine recently that contained an interview with the richest man at that time. When asked about how he made so much money he said that it was simple. He worked 12 hours a day, slept for 8 and spent 4 hours on other interests (which included investments). If you compare that to the average American – who works 8 hours, sleeps 8 hours, and has 8 hours to spare – the problem is perhaps not only that they need to harness more positive use out of this spare time. If you really think about it, 8 hours a day of spare time is actually quite a bit, and the guy in 1926 worked seven days a week, so there’s an extra 32 hours of spare time each weekend to be spent productively. So if spare time is one of our greatest assets as a nation, how come we get so little out of it? Perhaps a good start is to keep a time sheet of what you actually do with it. Simply write down how you spend your hours after work for one week and see if you can find some patterns. How much of this do you spend getting exercise? What about watching TV? Time with family? Working on your personal investments? Based on your findings, how much of your time can you dedicate to creating a second stream of income – basically a commitment of time and money to this new venture. If you can simply devote 1 hour per day of your 8 hours of spare time to mobile home park investing, that could make a huge difference in your financial future. If you listen to the Lecture Series events we do when we interview existing park owners, you’ll hear the common theme that they spend 4 hours per week managing those properties. That means that would allow you to not only manage your existing parks but also devote another 3 hours per week to finding new ones to buy. There’s an old expression that says “work hard and play hard”. This means that you should remove the time that is spent on mindless entertainment like watching television. Instead, what about re-directing this time to mobile home park investing? By getting rid of the “fluff” in your schedule, you may find that you end up being more focused on your other leisure activities and family relationships. If you spend 8 hours at work, 1 hour mobile home park investing, 7 hours in other leisure activities, and 8 hours sleeping, that’s a pretty healthy split, right? That little addition to forming an additional income stream could have huge dividends for you. Some people tell me “I can’t really do much after work because I’m too tired”. I also shared that problem in recent years. So, on a personal note, I buckled down and lost 40 pounds over the past two years. It’s made all the difference in the world. I have a fraction of the fatigue. I believe that I was propping my energy up with such toxic items as McDonald’s sweet tea and this only created an endless cycle in which I was causing the problem with my supposed cure. Losing weight ties back to the same issue we are talking about with time: re-directing your calories to cut out the “fluff” and devoting yourself to a healthy plan. Everyone has the time to start an additional income stream. Mobile home park investing can be easily merged with your current day job, and will not interfere with your family obligations. The key is simply to look fairly at how your time is currently spent and make the necessary adjustments. Decades ago, Americans cared very little about pollution. We pumped raw sewage into rivers and let gasoline tanks leak at the local service station. But all that changed in the 1970s with the discovery of the “Love Canal” which was America’s first superfund site. It was a canal in which companies dumped chemical waste and it negatively impacted those who lived alongside this water feature. After that the nation went on a witch hunt for all source of pollution and the subsequent clean-up. And mobile home parks can sometimes sit on top of bad things that can cost millions of dollars in remediation. So how can you protect yourself? The answer is the Phase I. What is a Phase I? It’s a study that is performed to grant the property buyer a legal defense under the national “superfund” mandate (also known as the innocent purchaser defense). Those who conduct a Phase I Environmental Assessment are off the hook for the cost of the clean-up should a major environmental contamination be found later and this includes any criminal penalties. 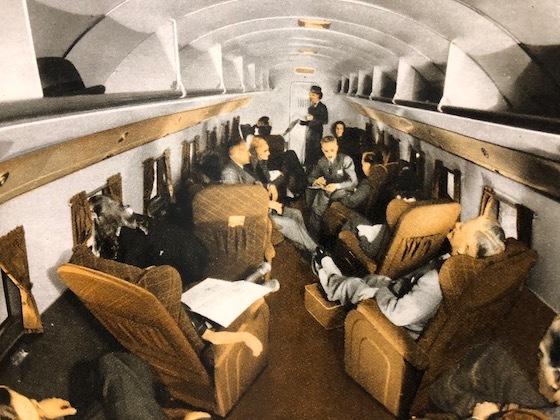 A Phase I includes research based on the EPA database of known contamination sites, aerial photography going back to the era in which the land was undeveloped, and on-the-ground inspection for telltale clues of environmental contamination. In addition to these steps, the environmental engineer looks at all other historical documentation including city directories of past business uses on the property and even interviews with knowledgeable individuals with knowledge of past property use. A good Phase I Environmental Report features all of this information is a highly organized binder, with the final summary letter as to whether the property passes or fails. Without a Phase I you run the risk of buying a contaminated property that is going to bankrupt you through the loss of your investment or worse. In addition, you will run afoul of U.S. law on pollution that could even feature criminal penalties. So it’s not an optional item. If the park fails the Phase I, your options are to drop the deal or do a Phase II and Phase III to determine the extent of the problem and the plan to remediate it. A park built on top of a landfill in a major metro area of Ohio. It was a gated community that just happened to be located on top of a former dump, with bursts of methane bursting out of the ground frequently. A park that had been built on top of an army munitions plant in the Midwest. Even worse, it was where the primers were made which are extremely dangerous and can go off without notice. Effectively, the park was on top of unstable WWII detonators – basically a land mine. In Montana, a park that sits on top of a Superfund site, containing arsenic and lead. The government knows about it, but the future park owner wouldn’t if they didn’t do the Phase I. A park in Iowa that is built on top of a former dry-cleaning facility (dry-cleaning fluid is one of the most dangerous carcinogens in the world). And these are just some of the most remarkable examples. In each case, the property itself looks like a great asset to own – there’s no visible clue as to what’s underground. Trick question: IT’S ALWAYS IMPORTANT. Never buy a mobile home park without doing a Phase I Environmental Assessment. Period. And don’t think you can get around this issue by buying “pollution insurance” as this will not necessarily protect you from the U.S. government’s actions stemming from the Superfund legislation. At a cost of only around $2,500, a Phase I is the best bargain of all third-party reports – because it can literally save your life. Don’t scrimp when buying a mobile home park and forego this huge protection. We would never buy a property without one – and we recommend that you do the same. One component of mobile home park investing – for most people – includes driving to look at both properties to buy as well as managing ones that you already own. So how can you make this drive time pleasurable. We’ve learned a lot of tricks over the past 20+ years of driving properties. Don’t do anything crazy, but indulge some bad habits in a small way to make yourself look forward to driving. And I’m talking fast food here. On every trip, pull into the drive-thru and buy something to eat that you would never do in normal life but that you always crave. This might be tacos at Jack in the Box or a Dairy Queen blizzard. Sure, it’s not good for your diet, but it won’t do much damage to your waist line just this once. There’s nothing worse for your body than sitting rigidly in a car all day. The better idea is to break up your drive with regular intervals of exercise. Set the timer on your phone and when it goes off every hour, get out and walk around a mall, park, store – whatever you can find that’s safe. Walk for about 15 minutes (which is around a mile) and then get back in the car and off you go again. There’s no reason that the highest and best use of your time while driving should be looking at the countryside. Instead, use this time to make calls and devise plans. There have been great brainstorms derived while at the wheel, and calls help to keep you mind active while you drive. Be sure to use CarPlay if you have it or put your phone on speaker phone – we don’t condone driving with one hand while the other is holding the phone. The U.S. trend for small cars is not in sync with the realities of pleasurable driving. If you’re renting or buying a car for your mobile home park travels, go with the full-size models. Sure, you’ll get less miles per gallon, but you’ll make that up in smiles per gallon. While the GPS can sometimes take you on curving country roads that might save you ten minutes, instead stick to highways and utilize cruise control. There’s no greater form of luxury travel in America than a large car on cruise control – it’s better than air travel, by far. It’s the constant braking that drives you nuts when driving, and a straight road with cruise control is extremely low stress. If possible, do not drive excessive amounts in one day. One thing that gives many people a bad idea about driving is the concept of going 10 or 12 hours in one day without stopping. While this may be the fastest way to get from Point A to Point B, it’s not the best way to do it. If you limit your driving to roughly 5 hours per day, then you will find the time passes quickly and you have no fatigue. Finally, one great way to enjoy driving is to build up the excitement of the important of your mission. 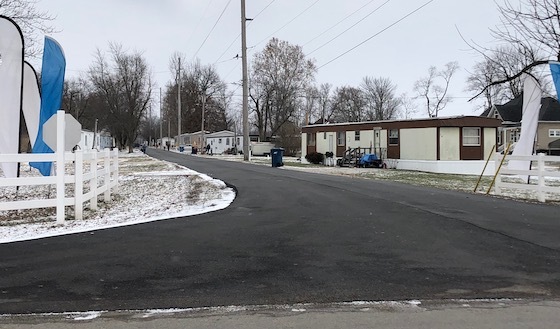 Every time I drive to see a mobile home park, I tell myself all about what I hope I see when I get there – perfect property condition and great pride-of-ownership. Any vacant home ready to sell with the appropriate signage. A community manager that is on top of the details. Just like Christmas, that makes getting there much more exciting to see if the park meets my expectations. Driving mobile home parks can be fun. You can look forward to it. It’s all in the way you do it. These tips can help. Is Your Attorney a “Deal Killer” or a “Deal Maker”? How many deals have you seen go down the drain because your attorney stacked up a million roadblocks to even the simplest problems, and then failed to offer any path to solve them? This is called “deal killing” and some attorneys do this so that they take no risk – if the deal never happens, they can never be criticized for missing a deal point, or for not spotting a flaw in the contract. The problem with this, however, is that you can’t get anywhere. At the other end of the spectrum are the “deal maker” attorneys that recognize real problems from trivial ones, and strive to solve these roadblocks using common sense and legal experience. And the best of those type of attorneys is Dave DiMarco from Woods Oviatt Gilman. We once had a deal go south in a big way – the very driveway into the property was determined to be on somebody else’s property. Any other attorney would have said “well, that’s it, the deal’s dead” but Dave DiMarco sprung into action. We located the owner, negotiated a purchase, personally handled the details, and the deal went forward. And all that over a weekend, no less. And that’s why we love Dave DiMarco and you should, too. If you need service like that, then consider using Dave DiMarco on your next transaction. You can reach him at (585) 987-2833. What Signs Belong In A Mobile Home Park? The 1970s classic hit “Signs, Signs, Everywhere a Sign” might have been written about a mobile home park. There are plentiful signs in most parks – and rightfully so. But what are the necessary signs to put up in your property and where should you put them? The first sign in any property is the “entry” sign, which tells the name, address and phone number of the mobile home park. This is the most important sign and, as a result, needs the greatest attention and capital investment. Let’s start off with the name of your property. Do NOT put the words “manufactured home community” or “mobile home park” on this sign – the industry is getting away from that. Anyone driving by can clearly see it’s a mobile home park. Just put the park’s name, address and phone number on it. Make sure this sign is perpendicular to the main road, not parallel, and that it’s large enough to be seen clearly. Most entry signs are 4’ x 8’ or 5’ x 10’ in size. The next most important sign in most properties is the locational sign pointing customer to the manager. Typically you have a sign at the entrance and then another at the office itself. These signs should feature an arrow pointing the customer in the right direction. This should be mounted on a white vinyl post with attractive cap probably 20’ up the entrance on the right-hand side of the street for incoming traffic. Your mobile home park is private property. You do not want anyone to enter your property and go door-to-door selling anything (including other park owners trying to steal your tenants). In many states and cities you have to post a sign stating “Private Property – No Trespassing” or people have that right. IF this is the case, this would be very important to put near the entry, perhaps beneath the manager directional sign. 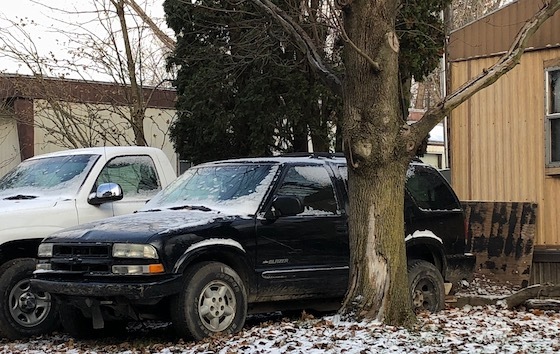 Just like the private property sign, in many areas you have to post a notice that unauthorized vehicles will be towed in order to enforce your rules on towing non-running cars. If that’s the case, then this should also be on a pole near the entrance. But if it’s not required, then skip it because the more signs you have that are negative in nature the more your property looks uninviting. These signs are important from a liability standpoint and will be heartily recommended by your insurance agent. The normal speed limit is either 10 or 15 mph (some parks use 5 mph but that’s pretty unreasonable for anyone to obey). While there’s no way that you, as the park owner, can make sure that nobody speeds, it’s important to let them know that doing so is unacceptable and, if there is an accident, it’s vital that you have done well with the paper trail by posting the speed prominently. These signs are recommended by most insurance carriers but not required. But at a cost of only about $40 per sign, why would you not post them? Most parks have one of these at each entrance, and possible a couple more throughout the park depending on the size of the property. Speed bumps are always an interesting topic to discuss. Most insurance companies see them as both an asset and a liability, so they are rarely recommended to be added. There are probably more injuries and lawsuits from speed bumps than property and life that is saved as a result – there have even been recorded fatalities from speed bumps. The general rule is to approach each park on a custom basis, looking at what’s already existing and the benefit of adding more. The general rule is to not add them, and to make sure existing ones are not too extreme. That being said, it’s always a good idea to put a sign up to notify the driver of a speed bump in both directions, so they can brake to minimize the effect. Again, it will come in extremely handy if there is an accident. If your park has a swimming pool, it’s essential that it has all of the mandated signage warning the users of the dangers involved. These include depth markers (so people don’t get in too deep) as well as “no lifeguard on duty” to let them know they are on their own. 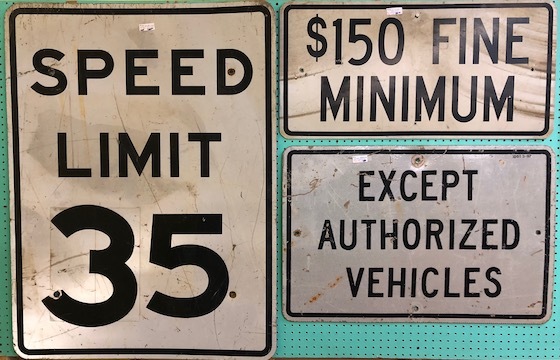 There may be additional signs required by state, county or city ordinance, and you better have every single one of them and in the correct position. Swimming pools are a dangerous amenity, and you need all the right signs to lower your potential liability risk. If you have a central mailbox area, it’s always a good idea to install a Fair Housing sign from HUD, as well as supportive signage to welcome residents home and even announce events in the property. A good, locking, all-weather, community bulletin board will do wonders to keep your customers informed and happy with their decision to live there. Signs are important tools in mobile home parks, and you should be sure to have the right ones and in the right places. This list will get you going. For more information on this program visit their website or call Candice Doolan at 800-955-0021 ext 1735 or email her at [email protected]. The Frank & Dave Christmas Show is our annual review of good deeds, bad deeds, predictions for the New Year and an opportunity to give back to our residents. 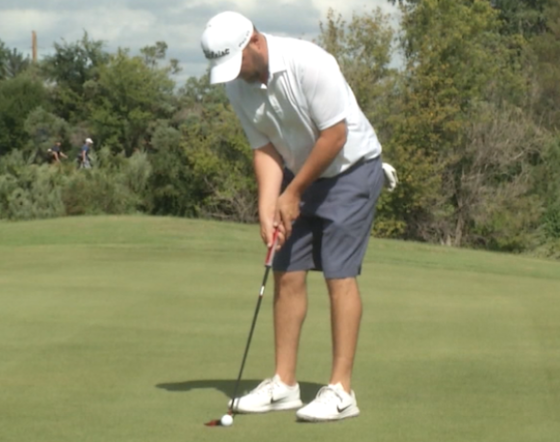 This year we gave away some really big items, and we think you’ll really enjoy the reactions. So although the eggnog in your refrigerator may be expiring, go grab a glass and click here to see what you missed. And have a belated Merry Christmas! College football is in full swing, and many prefer it over the NFL. In the same vein, many park owners prefer college towns to virtually any other type of metro market. So why do owners (including ourselves) love college towns so much? The first thing you’ll notice in college towns is a sense of enthusiasm and positivity that is seldom at as high a pitch in other markets. Maybe it’s because of the sports and theater programs, or maybe it’s because there’s always a freshman class bubbling with excitement. The bottom line is that these towns have a winning attitude towards business that’s contagious and always works well. Our three favorite types of employment are 1) healthcare 2) government and 3) education. Why is education such an important bedrock? Because colleges can’t really layoff or downsize. Parents are going to send their kids to college in good times and bad, and the government provides student loans to make that perennially possible. Even in the middle of the next Great Recession, you’ll find low unemployment stats in college towns as they are basically insulated from reality. College towns are typically a pretty affluent market. Your have all those high-earning teachers and staff, coupled with kids that are subsidized from home and pretty demanding customers. As a result, it’s normal to have high median home prices as well as apartment rents, which results in higher lot rents. And, again, since these areas are protected from reality, the housing numbers seldom go down. In today’s high-tech world, many industries pull their talent directly from colleges. That’s typically where you’ll find new companies going in (just look at Google and Austin) as well as hospitals that want to tap into medical schools. These are also great employers and mostly recession-proof, as well. We have never had an investment go bad in a college town, and that’s why we have so many in our portfolio. All in all, probably one of the best attributes we can hear when first looking into a potential deal is that there’s a college in the town. 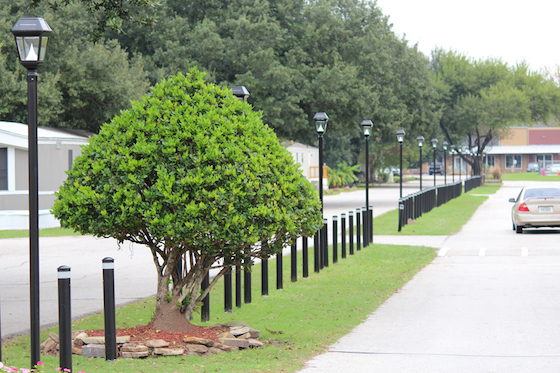 College towns and mobile home parks are a great match. They typically offer solid employment and housing without exposure to economic downturns. You should give additional attention to these situations. Need A Phase I Environmental Report? Mike Renz Is Your Man For The Job! The New York Times called Frank a human encyclopedia of all things mobile home park and, if that’s true, then Mike Renz is the human encyclopedia of all things under the ground. You see, when it comes to Phase I Environmental Assessments, nobody in the industry is more knowledgeable than Renz. He’s our go-to guy for all things pollution-oriented, from Phase I reports to simply asking questions on what we see going on next door to the property (or even inside that concerns us). We were once walking through a property and saw a brown colored solution oozing from the property. Within minutes, Mike had pulled up the data and figured out what it was (rusty water from an iron-ore- rich artesian spring). That’ the kind of information that we find invaluable in today’s litigious world of environmental condition. On top of that, we’ve had Phase I reports that failed for existing pollution, and Mike Renz has been able to solve them by using common sense and technology, like the time he proved the EPA wrong by doing a simple core-drilling to prove that a supposed landfill on a mobile home park did not actually exist (it had been phoned into the EPA by a former manager who had a grudge against the owner). If you want that level of expertise on your side, then you need Mike Renz to be your Phase I Environmental provider. That’s who we use, and he’s amazingly good.